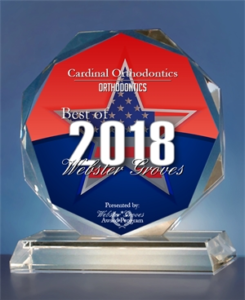 Cardinal Orthodontics has been selected for the 2018 Best of Webster Groves Award in the Orthodontic category. Winners were selected under each category by the Webster Groves Award Program after gathering information and data on businesses in the local community. Each year this program seeks out companies in the area that enhance the image of small business and exceptional service to their customers. These businesses continue to help Webster Groves be a great place to live! Cardinal Orthodontics, formally known as Webster Groves Orthodontics, switched ownership from Dr. Peter Crump to Dr. James Galea in September 2017. Though the name has changed, the practice has proven to provide the same outstanding orthodontic care that Dr. Peter Crump offered for many years in the Webster Groves community. At Cardinal Orthodontics, patients can receive treatment through metal braces, clear braces, or even Invisalign. They work with each person individually to assess orthodontic needs as well as their personal smile goals. Dr. James Galea and the team at Cardinal Orthodontics are proud to be a leading Provider of Invisalign in the St. Louis area. They strive to offer the latest technologies in the orthodontic field. Cardinal Orthodontics is honored to have received this award from the Webster Groves community. They look forward to another year of providing great orthodontic care to local friends and family.